Closed chain exercises using Pilates equipment is a safe and effective way to exercise. In this closed kinetic chain movement the limbs are stabilized with the feet on a solid surface such as the footbar during Pilates footwork exercises. Then the body can move away from the limbs with less stress on the joints. Using the Pilates Reformer for a stable base gives you the advantage of variable resistance along with hip and knee flexion and extension. Closed Kinetic Chain Exercises are generally safer than open chain exercises(the limbs are not stabilized by a solid surface), especially when it comes to joint stability. I have found exercising this way to be especially helpful for older active adults who have arthritis or other joint pains and instability. This type of movement also translates well into daily activities such as walking and running. Correct leg, foot, and ankle alignment. Improves flexibility in the legs, ankles, and feet. Improves Strength in the hips, legs, ankles, and feet. 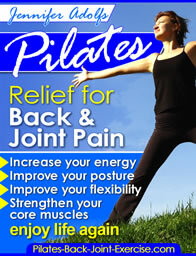 Creates Balanced muscle development around the hips, knees, and ankles. Improves and realigns foot, ankle, knee, and hip mechanics for activities involving running, walking, racket sports, dancing, etc. 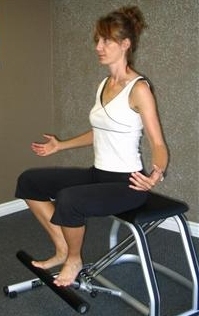 Helps to recover and rehab from knee, hip surgeries, and other injuries where closed chain exercises are controlled. 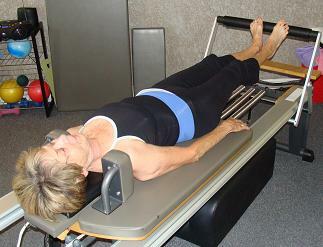 See examples of these closed chain exercises on the Pilates Reformer and Pilates Chair at these links. Exercising this way is very helpful for clients with Genu Valgum or "Knock Knees". I like to use the stable footbars or a solid base and then use a prop such as a Pilates Magic Cirlce or resistance band around the thighs as they are doing the Pilates footwork. Then I can cue them to abduct or press the thighs out into the Circle or Resistance Band to keep the knees in better alignment as they do their footwork on the equipment. For clients with "Bow Legs" I use a small ball just above the knees and at the ankles to align the legs. Then I cue them to gently squeeze or adduct the thighs keeping the ball in place as they move their body away from and then back to the foot-bar. Doing these closed kinetic chain exercises consistently and over time with props (if needed) will help to train the muscles of the lower limbs to work more effectively and with less risk for injury.